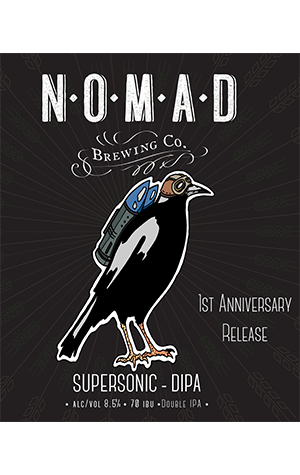 For their first birthday release, the team at Nomad did a little tinkering under the hood and brewed a one-off, super-sized version of their regular Jet Lag IPA. Named Supersonic, what they’ve effectively done is double the ingredients to create a double IPA that has its roots in the American take on the style but its feet firmly planted in Aussie soil. The malts have been upped to provide a stronger and sweeter backbone and it’s this which is most immediately apparent, along with the use of native finger lime. Having a local ingredient is something of a house feature for the Brookvale brewery, with a native fruit, herb or spice of one sort or another appearing in almost all their beers. And it's difficult to think of another beer that’s put a local ingredient so front and centre recently, with the finger lime's big citrus whack adding to the floral and fruity hop notes. Of those, there are plenty. It’s an Aussie and American amalgam featuring Galaxy, Cascade, Ella, Summer, Topaz and Vic Secret – double dry-hopped for good measure. As if that weren’t enough, they swapped out the normal Jet Lag yeast in favour of an American one that would help accentuate all of the above and ensure the Supersonic is a bigger, faster and louder beer in every regard. There certainly is an awful lot packed in here, but it’s all been engineered to work together very nicely. Get it fresh to experience maximum lift off.